This Spiral Rope necklace was beaded using a technique I developed for adding fringing and texture as you bead, without having to go back afterwards. 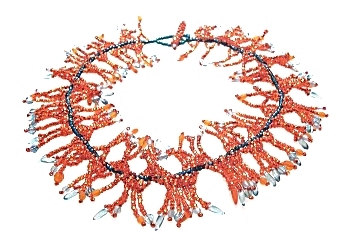 It uses orange and blue seed beads with drops, daggers and facetted beads at the ends of the fringes. The technique for making this is taught in my Spiral Rope Class.